This is a small movie. Very diminutive in scope and quite lacking in budget. The characters are mostly flat. The setting is an un-noteworthy Israeli desert town. And the whole movie spans a single day and night. 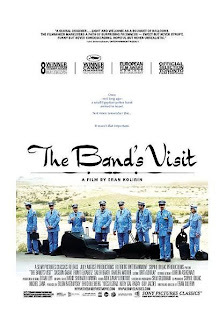 Fortunately, The Band's Visit is much larger than the sum of its small parts. Stripped of all pretense and cruft, it is a clean, uncluttered story centered around Tewfiq, the leader of the Alexandria Ceremonial Police Orchestra, and their unexpected, overnight delay in a slow, desolate city. Very crisp. Very clean. Subtle, unintrusive direction. Fluid acting. Unpretentious dialog. Satisfying and pleasant ending. Great date movie. But too slow for the kids. Rent it. Enjoy it. I did.